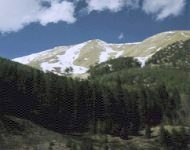 A few miles east of Eisenhower tunnel at an off ramp of I-70 there is a parking lot at the trailhead to Herman Gulch and Watrous Gulch. We began our hike on this "dual" trail until it split - several hundred yards from the trailhead. Following the sign to Watrous Gulch we stayed on the trail which took us in an easterly direction. While the trail was well taken care of it did become fairly steep in several places After hiking for about a mile, the trail curved to the north and away from the highway. This is where we first encountered snow. The summit of Mount Parnassus from near the begining of the hike. With our ultimate goal across the valley to the east we chose to leave the trail (and the snow) to find the easiest route to the summit. This took us down into the valley to cross Watrous Creek which, although it was running fairly fast, was still small enough to cross without getting wet by stepping across several rocks. Now on the other side of the creek (east side), our climb began and didn't end until nearly the summit! We chose our route as we went and discovered a few small patches of snow that we had to cross which were tucked between some of the last trees below timberline. After slogging our way uphill through the snow and trees for several hundred yards we finally came out into the open. We were higher on the hill and found that we were now in a dead forest which somehow had an eerie beauty to it. Some of the trees were still standing and some were lying rotting, They had all been dead for many years so they were colored in shades of grew, gold and brown. At the top of the dead forest there was a relatively flat spot which we chose for a short break. My route up the ridge to the summit of Mount Parnassus as seen from Kelso Mountain. After eating a Cliff Bar, drinking some water, and catching our breath (the hike was steep from the creek up until this point) it was time to climb/hike some more. This involved a circuitous traverse up the hill to the north and then to the east. Again, the mountain was still steep but overall there was good footing. As we rounded the ridge which hid us from the highway sounds my partner decided to "set up" at around 12,800 ft. (only a guess). His choice of a spot couldn't have been better - on the middle of a hill on the backside of a ridge with a view across a (sub-) valley filled with snow under a blue sky while laying in grass meadow that had only just begun to seek the sun´s light! With my hiking partner in a safe spot, I continued up this steep slope through terrain ranging from loose dirt to a talus slope to grassy pitches. This went on for what seemed like forever - climbing about 50 ft. vertical - stopping for a moment to take a few breaths - and climbing again. In all actuality I probably climbed around 750 feet to reach the ridge which I would follow to the summit. 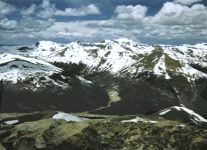 The ridge (left center) to the summit of Mount Parnassus as seen from Bard Peak. Once on top of the ridge, I could again see the highway below me to the south. From this point it was now a relatively easy walk to the summit. This involved a climb of probably around several hundred vertical feet in a distance of about a half mile. The ground was solid but rocky - no snow on this side of the ridge but there was a huge cornice to my right (facing the highway). After about 10-15 minutes of hiking along this ridge and with several other high spots out of the way, I reached the summit of what I was to discover is Mount Parnassus - 13,574 feet above sea level. The views from the top were outstanding! The sky was a wonderful Colorado blue, the clouds were puffy, white, and intermittent, and other than at a ski area I don't think I have ever been on top of a mountain when all of the other mountains surrounding me still had so much snow! Looking west down towards Eisenhower tunnel. Below me to the South was I-70 - above that it looked as though I could reach out and touch Grays and Torreys Peaks. 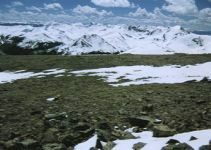 southeast of me was Mount Evans. To the west I could still see the highway and the entrance to the tunnel. Of course, above this was the Continental Divide (and the Loveland Loop). Back to the northeast I could easily make out the Indian Peaks Wilderness however Longs Peak was mostly obscured by haze. Directly below me in the same direction was the head of the valley that contains Ruby Creek. At my feet was a huge cornice that had broke sometime before my arrival and I could see the resulting slide in the valley many hundreds of feet below me. After signing the register it was now time to head back down to try and find my partner. I made good time along the ridge but once I had to drop off the back side to retrace my steps, my progress became much slower. Going up my footing seemed pretty good however going down required careful thought about every foot placement. Some of the rocks were unstable which could have easily lead to a twisted ankle. Coming down this slope made me realize just how far I had climbed to get to the ridge! The summit was large and relatively flat. Sure enough, I found my hiking partner for the day, laying down, sleeping, in the exact same location I had left him. Apparently he did not miss me (as I was gone for something between and hour-and-a-half and two hours) and he took the opportunity to enjoy the peacefulness of the mountains - away from work and the city. Solitude was a rare event for my partner. After "picking up shop" we retraced our steps down the hill to a point higher up on Watrous Creek than where we had crossed earlier. This allowed us to use several snow-bridges to get to the other side of the valley. From there we followed the creek while traversing the hillside. This lead us to footprints in the snow which lead to the trail which took us back to the trailhead. Whew! Not bad for an early season hike! Along on this hike with me: Larry.